This week I've had a lot of time off which has been wonderful. It means long walks in the park with the pup every morning which has given me a greater appreciation of quiet mornings spent surrounded by nature. 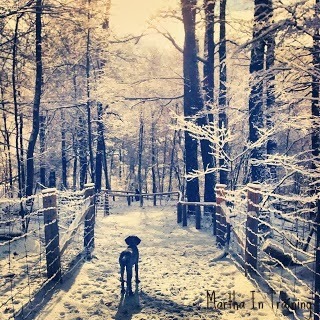 Last week during the cold snap we had I was lucky enough to snap this picture on my phone of Reese enjoying the snow. As cold as it was it was hard to be upset when it looked that beautiful outside. 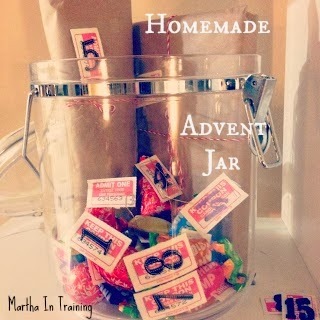 I also put the finishing touches on John's Advent jar (minus one gift that I'll need to pick up still). It's been a trial in patience not eating any of his Lindt or Terry's chocolate orange chocolates. I used tickets I bought from the dollar store for the Bad Christmas Sweater fundraiser raffle two years ago. On them I stuck numbers from a bunch of sheets I had (I used a lot of the letters but thankfully had almost all of the numbers I needed left). Then I stapled them to the chocolates or taped them onto the gifts and left them for John to take. 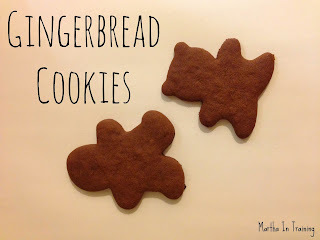 I also had some time to bake up a batch of sugar cookies and a batch of gingerbread cookies. There's more dough in the freezer just waiting for the next time I want cookies. The gingerbread batch turned out phenomenal - easily the best batch I've made. No cracks in the dough, perfect colour, and that lovely taste of molasses. I used the Martha Stewart recipe from her Cookies book which can be found here. Tonight John and I are hitting the Christmas Market in the Distillery District (and going to see the Nutcracker on the 28th!). Aside from missing the Cavalcade of Lights (I was working, maybe next year) I will have done everything on my Christmas To Do list. And Saturday we're putting up the tree!